Power of Testimonials - FCHC Inc.'s clients sharing their compensation stories. Job Noise: Cut-off saw, trimmers, Sanders, edgers etc. Hearing Loss Benefits: Hearing aids, batteries, and repairs for life, as needed. "Our lives have changed for the better, God Bless you!" Job Noise: Cranes, Pneumatic tools, Generators, Compressors etc. Hearing Loss Benefits: $18,300, plus hearing aids, batteries, and repairs for life, as needed. Job Noise: Sanders, edgers, forklifts, patching machine, etc. Hearing Loss Benefits: $18,921 plus hearing aids, batteries, and repairs for life, as needed. Job Noise: Cut-off saw, trimmers, clippers, hog, planers, etc. Hearing Loss Benefits: $46,000, plus Hearing aids, batteries, and repairs for life, as needed. "It took approximately 1 year for my claim to be approved. After receiving the huge compensation award and my hearing aids, I was glad I went through the process!" Job Noise: Jet engines and other aircraft, etc. Hearing Loss Benefits: $8,500 plus hearing aids, batteries, and repairs for life, as needed. "It took just a few short months and I received these great benefits!" Job: Security Guard for Construction Co.
Job Noise: Sandblasting, heavy equipment, etc. Hearing Loss Benefits: $18,700, plus hearing aids, batteries, and repairs for life, as needed. "I couldn't have done it without the help of the 'Federal Certified Hearing Center". Job Noise: Routers, mold machines, power tools, jackhammers, generators, compressors, etc. Hearing Loss Benefits: $57,000, plus hearing aids, batteries, and repairs for life, as needed. "I am very thankful for the help I received from the 'Federal Certified Hearing Center' in filling out my paper work for the completion of my claim". Job Noise: Power saw, yarder, loader, whistles, power tools, etc. Hearing Loss Benefits: $9,000, plus hearing aids, batteries, and repairs for life, as needed. Job Noise: Jackhammers, Pumps, Generators, Compressors, etc. Hearing Loss Benefits: $7,000, plus hearing aids, batteries, and repairs for life, as needed. 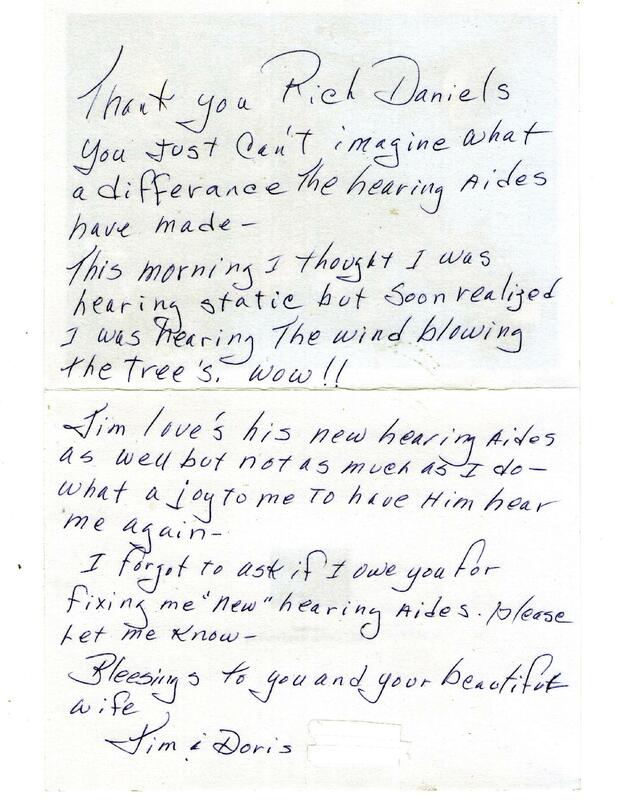 "I was very skeptical of anyone saying that there could be cash given to me and my hearing aids paid for. But, 6 months after filing my claim, I received a $7,000 check! I am now wearing my second pair of hearing aids also provided through my industrial insurance!" Call us or fill out the form below, servicing 17 convenient locations in Washington State.